The Penn and Teller Las Vegas show at the Rio features one of the most famous duos in showbiz. World famous comedy illusionist duo Penn and Teller have been dazzling audiences with their eccentric, mind-blowing, death defying, and totally unique act for over three decades. Despite their insanely busy schedule, which involves producing and starring in an Emmy nominated TV show for Showtime, writing three best-selling books, and making multiple talk show appearances every year, they somehow find the time to perform at the Rio night after night. 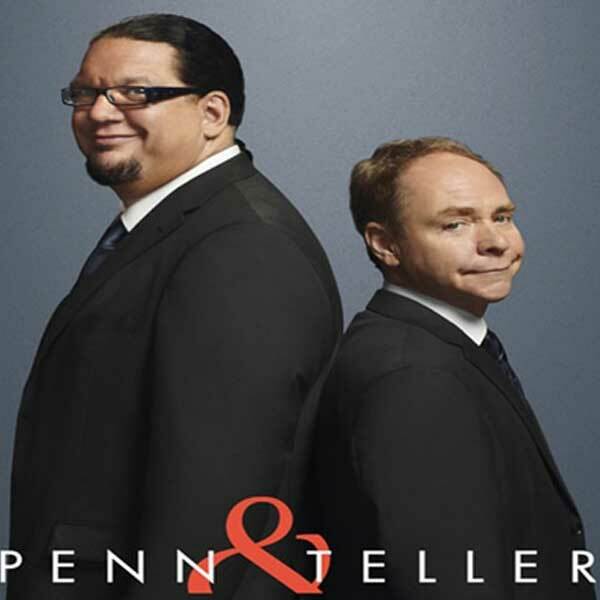 It’s easy to tell the iconic and eccentric duo apart: Penn is the tall pony-tailed big guy who never stops talking and Teller is the curly-haired short one who never talks at all. Their unique chemistry has kept them together as a team for decades, and their act has become an American showbiz institution that’s found a perfect home in Sin City. While many Las Vegas magic acts have a bit of a cheese factor, the duo’s show at The Rio is classy, sophisticated, and without all the flash and dazzle that other magicians employ onstage. They present their illusions simply, without smoke and mirrors, pyrotechnics, or loud sound effects. Instead of pounding rock to get the crowd amped, a jazz pianist tinkles the ivory before the duo hits the stage and sets a classy tone before the show even begins. Along with spectacular card tricks and illusions, a typical show involves the duo hanging upside down in strait jackets over beds of nails, blind-folded volunteers throwing knives at them, fire eating, and, in the center-piece of their show, the duo simultaneously firing guns at each other and catching the bullets in their mouths. Through all of the mayhem, the motor mouthed Penn narrates with wit and dark humor. The duo is also unique among magicians in that they present their illusions so that the audience can see the inner workings of each trick as they’re presented, which makes the crowd feel as if they’re in on the act. Students of magic and showbiz history and skeptics at heart, Penn and Teller teach their audiences not to trust everything they see while simultaneously dazzling them with their illusions. The iconic magicians have honed their chemistry to perfection after performing together for three decades, and their show at The Rio is a perfect showcase of their sensibilities: witty, sophisticated, eccentric, unpredictable, darkly funny, and mind-blowing. Without all the flash and dazzle of some of the massive Sin City stage spectacles, their show has become a must see Las Vegas institution.